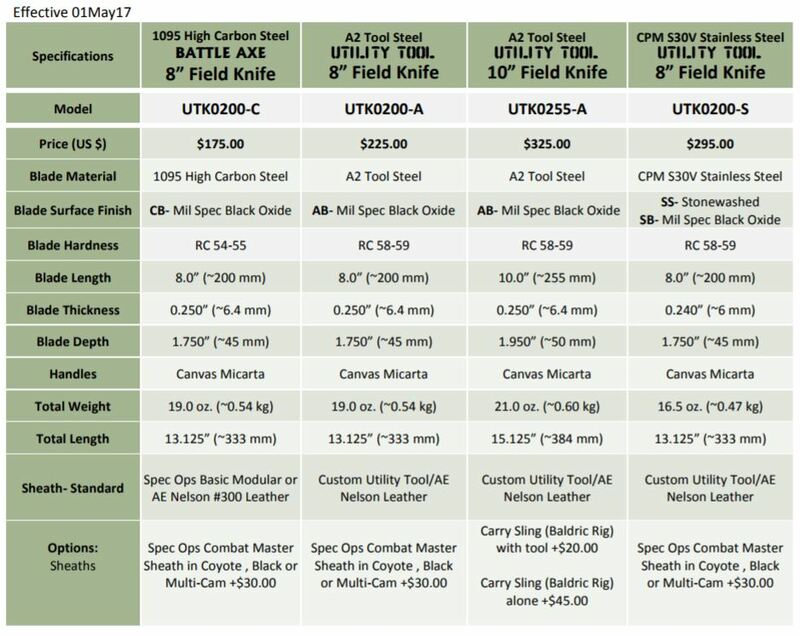 The UTK0255 10-inch blade Field Knife was added to the Utility Tool family of knives as a direct result of experiences in the field. The entire story behind the UTK0255 can be found on the prototype page under “pre-production-prototypes”. This tool has a curved 10” blade of 0.250” thick Crucible A2 Tool Steel that has been refined to provide the most utility in a reasonably compact package. In field trials, the design has proven itself to be an effective camp tool in a variety of tasks from removing tree limbs and cutting brush to splitting wood with and without a baton. At approximately 21 ounces and with a balance point 2” in front of the guard, this tool works as an extension of the user in accomplishing tasks with ease that would challenge other tools. There are two handle profiles available for the UTK0255, the ‘Slimline’ conventional handle with a belly and the ‘Ajax’ with a swell at the pommel. 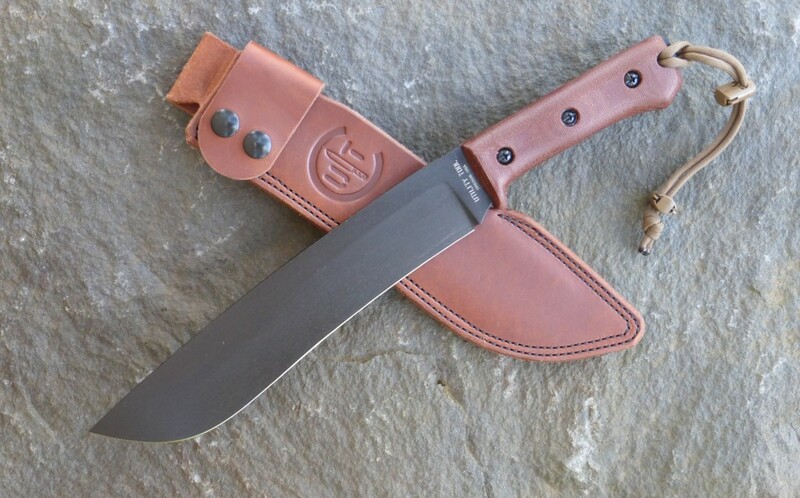 These are available in either natural or black canvas micarta. Each UTK0255 comes with an AE Nelson front loading sheath with a wide retaining strap secured with twin snaps. 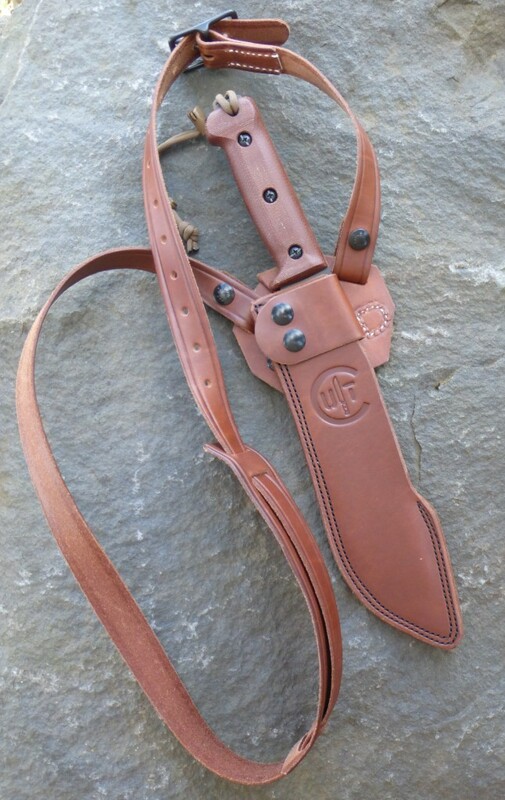 Also available is a custom ‘Baldric Rig’ sling made by AE Nelson designed to support the tool in its sheath when in the field, allowing ease of access as well as making the extended carry of the tool convenient. 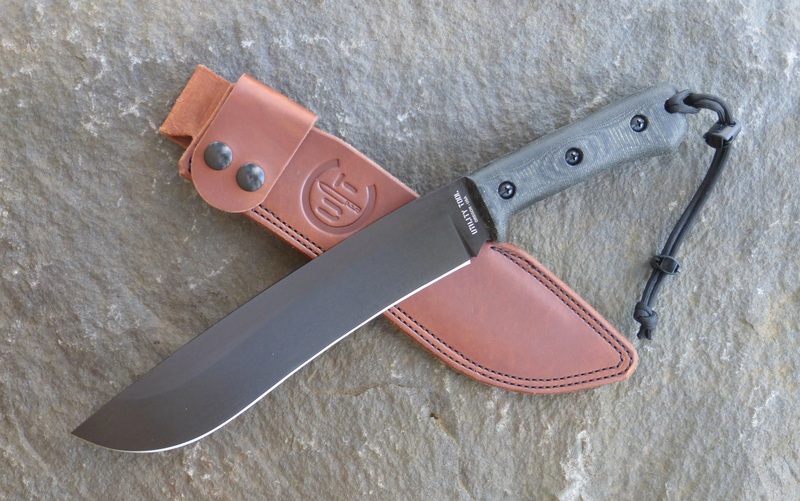 UTK0255 with the Ajax handle profile in black canvas micarta. 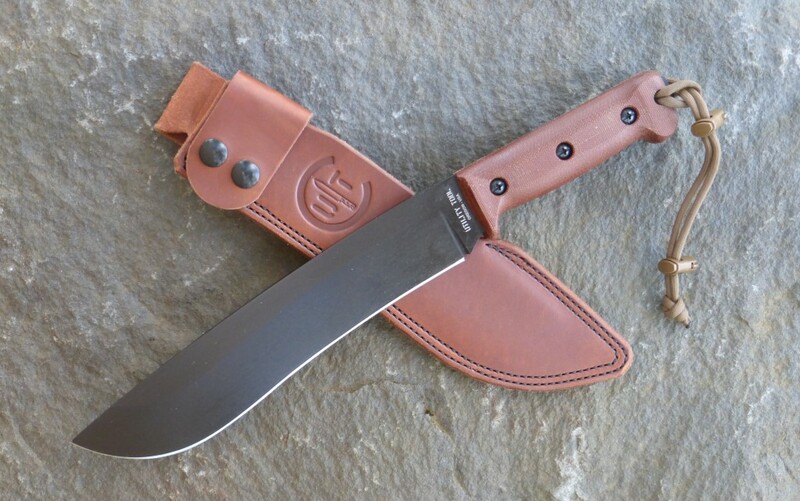 UTK0255 with the Ajax handle profile in natural canvas micarta. 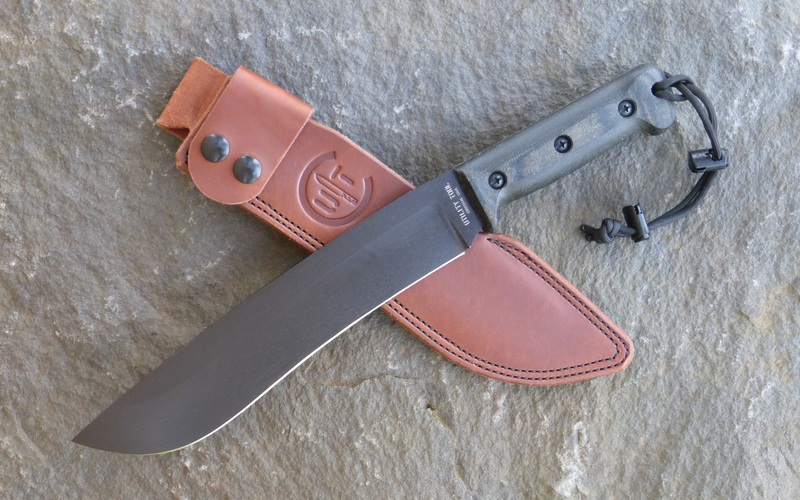 UTK0255 with the Slimline handle profile in black canvas micarta. UTK0255 with the Slimline handle profile in natural canvas micarta. 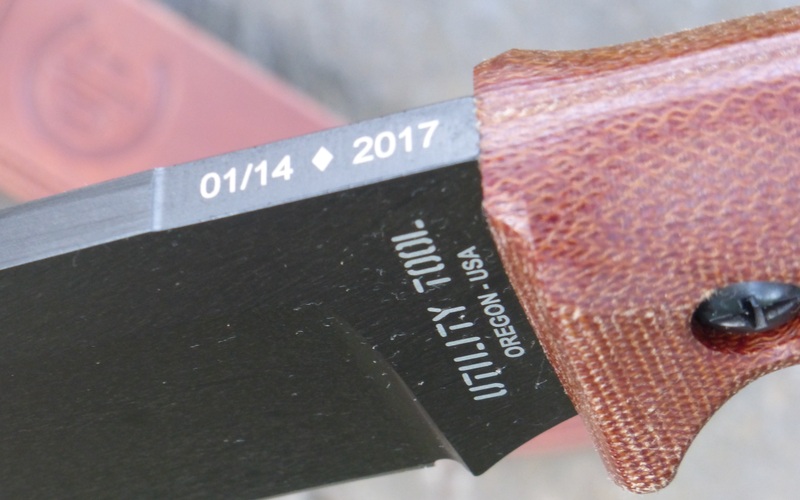 Detail of the UTK0255 with the Ajax handle in black canvas micarta. Detail of the UTK0255 markings. 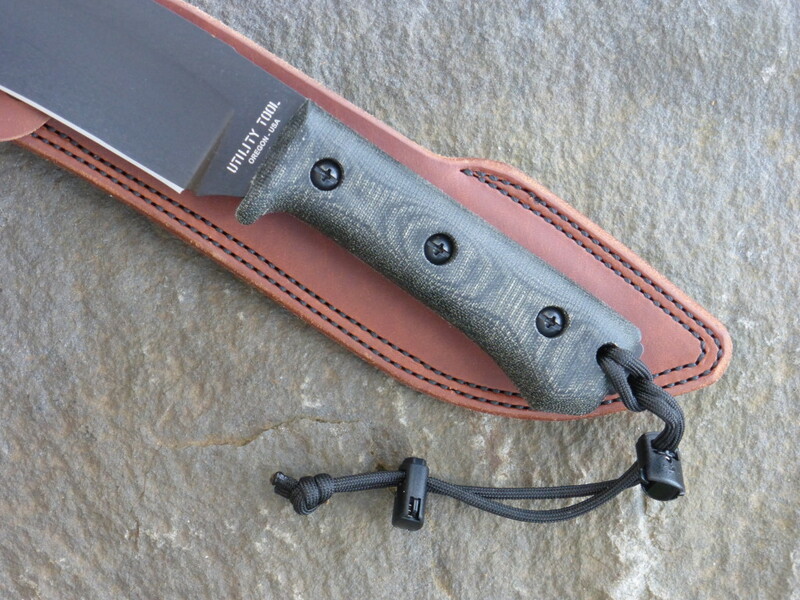 UTK0255 10” blade Field Knife in the standard AE Nelson sheath and optional Baldric Rig sling.